Vous souhaitez poser une question à l'établissement Thai Inter Hotel ? L'emplacement de choix du Thai Inter Hotel dans le quartier des sites touristiques, culturel, des affaires de Nakhon Ratchasima, en fait un établissement propice à la détente, loin du travail. De là, les clients peuvent facilement se déplacer et profiter de tous les avantages offerts par cette ville dynamique. Pour les visites et les sorties, pas besoin de chercher loin ! L'établissement est proche de remarquables points d'intérêts de la ville, tels que Marché de nuit de Wat Bul, Temple Phra Narai Maharaj, Sanctuaire du Pilier de la ville, Nakhon Ratchasima. Le Thai Inter Hotel dispose de nombreux équipements pour rendre votre séjour à Nakhon Ratchasima encore plus enrichissant. Pour ne nommer que quelques-uns des équipements de l'établissement, citons WiFi gratuit dans toutes les chambres, sécurité 24h/24, ménage quotidien, réception 24h/24, stockage de bagages. Profitez d'équipements de qualité supérieure durant votre séjour. Certaines chambres sont équipées de internet sans fil (gratuit), chambres non-fumeurs, climatisation, service de réveil par téléphone, bureau, qui permettent aux hôtes de se détendre et de recharger leurs batteries après une journée bien remplie. Grâce au vaste éventail de loisirs proposé par l'hôtel, les hôtes ne manqueront pas d'activités durant leur séjour. Le Thai Inter Hotel est un incontournable pour ceux qui cherchent un hôtel de qualité à Nakhon Ratchasima. rapport qualité-prix correct surtout avec le petit déjeuner mais assez éloigné du centre ville; cependant beaucoup de bon restaus autour. On peut regretter que la jeune femme de l'accueil ne soit d'aucune aide pour renseigner sur les environs et qu'elle ne comprenne pas l'anglais. Beaucoup de gentillesse mais ne parlent pas anglais sinon par l'intermédiaire de la traduction orale d'un tel. portable. Très compliqué mais drôle. Pas de table de nuit supportant un éclairage pour lire au lit. Malgré ça je reviendrai. Hotel agréable et calme. Chambres grandes, et propres. Matelas de bonne qualité, le mien était neuf! Un peu de bruit mais ça allait vraiment. Clim ok. Pour un ou deux soirs, c'est très bien. Le personnel fait des efforts pour parler anglais et vous aider dans vos recherches ou demandes. Facile à trouver, pas cher. Ancien hôtel mais propre et assez bien entretenu,grand parking gardé, pas d'ascenseur ni de piscine , personnel sympathique. La chambre était petite ainsi que la salle de bains, lino de la chambre très usé, murs repeints depuis peu , climatisation changée récemment, le wifi fonctionnait bien.Petit déj. banal ou bonne soupe de riz . Hotel très bien situé, plein centre près des restaurants et du marché nocturne. Le petit déjeuner n'est pas copieux mais par rapport au prix on ne peut pas demandé plus. The rooms is quite spacious, good working shower with very hot water. Didn't have breakfast there, but it didn't look like it was the best. Centrally located, place for parking, plenty of nice cafés and restaurants within walking distance. Besides the dismal breakfast i was suprised what this hotel had to offer. Located in an eclectic hip and upcoming area of the city, this hotel is quiet, secluded and has fine rooms. Good ENglish chanels, wifi and their gems are their staffs. My room has a garden view from the balcony and the bed was a queen sized bed. The area is doted with hip and trendy restaurants and bars. The hotel itself is located right opposite "The Tap" bar which is worth the visit. Even I arrived there very late at 01.30 am., I was fully welcome. Morning calls of 3 times were correctly done. The cheapest room I booked also had a small garden in the back yard. T.V and air conditioner were in good condition. I asked to check out late at 14.00, she accepted but finally, I was leaving at 13.00 for lunch. The room appeared new and clean, and was well - equipped with a very comfortable bed, fridge, desk, a sitting area, and even bedside lamps. There was a small balcony, where you could sit. The shower may have been one of the best, I have experienced in Thailand on this trip, at least - considering water - pressure and temperature. The room was cleaned every day, and the surroundings nice and quiet. The hotel is within walking distance of the YaMo monument and the more interesting temples; there are a number of bars, cafés, restaurants and supermarkets in the immediate vicinity, and the night market is very close as well. The staff is friendly and helpful, and we enjoyed our students VERY much... The hotel is highly recommended!!!! I would categorize Thai Inter as a business hotel a bit past its prime. That said, I would definitely stay there again for a night or two. Great staff, good beds, excellent shower and Hansa restaurant down the street - all happy making. This was my second visit to same hotel and it is now my favorite hotel in Korat. Location of hotel is perfect if you come by car, parking place is spacious, most of parking places are covered and it is guarded all the night. Wi-Fi internet is now much faster and works great every time, hotel room is clean and staff , including the owner, more than just friendly. Actually they are so friendly I have no problem to decide this will be my hotel for next visit to Korat. For being in the center of town this place was pretty quite. They had decent sized rooms and the free breakfast was pretty decent also. They only 2 things I didn't like were the beds are a little hard(normal for thailand) and there is no elevator. So, we just thought of the walk up stairs as our workout. They have plenty of free parking. I'd recommend the thai rice soup in the morning if you want something that seems to be more healthy than the pork and eggs western breakfast. I wish they had fruit with part of breakfast. I'd stay here again, in fact, I'm sure I will be back when I come back to visit the in-laws. We stayed at Thai inter Korat for 4 nights. It was a really good hotel, breakfast included, free internet access next to the front desk, free parking. 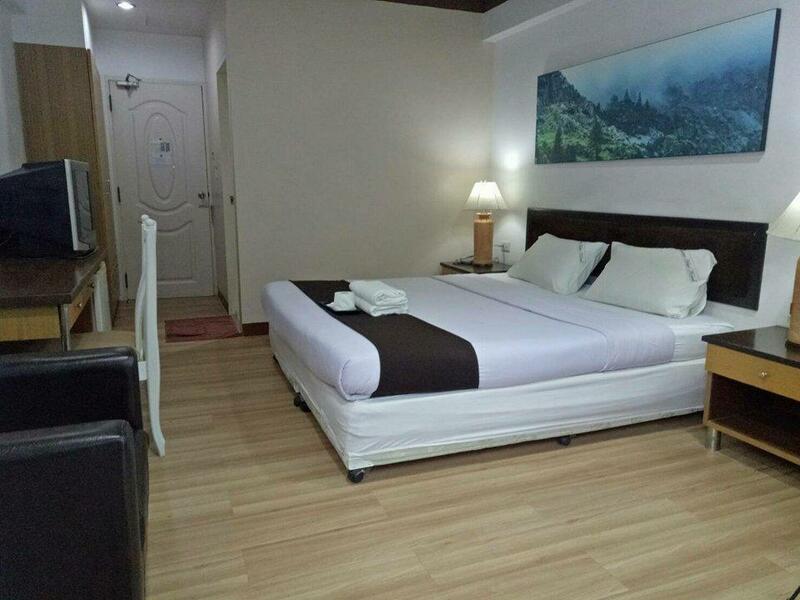 The hotel located in downtown Korat which close to shopping center. We definitely will stay at this hotel again. Location of hotel is just perfect, in the old city center, near the klong and easily reachable thought main road. You can walk to many interesting places in old town but on the other hand there is big car parking so you can come with car and have no problem parking. Rooms are big enough and clean, service is great and staff very pleasant. Breakfast has some room of improvement since you can only choose American or Thai version but is ok.
Near next to Hotel two food place. and Harley Davidson gang Bar.. I stayed at the Thai Inter Hotel for 4 days while visiting Korat as a tourist. My comment overall is it is just an average budget to middle level hotel. The good things about were. There are many good restaurants within easy walking distance of the hotel and there are two very good local Thai pubs closeby. The bad points are it outside of the main CBD so that you need to get a taxi to get anywhere in Korat and also I found that it was very hard to hail a taxi from outside the hotel and quite often had to get the staff there book a taxi for me. The hotel is really centrally located. Breakfast was okay, nothing transcending. Beds were comfortable but a bit hard. Overall, average stay, but excellent value ! you get what you pay for! 600 baht including breakfast for a room with hot shower, decently cleaned and balcony is great.